OSDD has undertaken research for drug discovery for Neglected Tropical Diseases with TB as the first disease target. The CSIR’s Open Source Drug Discovery programme for TB (OSDD TB) will function as a consortium with international partnership to promote a collaborative model for the search for novel anti-TB drugs. It provides an open access, unified collaborative research platform for the TB research community to share existing resources and expertise geared towards drug discovery and development. This would ensure that harmonized procedures are followed and the requisite resources and reagents available in different laboratories are shared for specific objectives identified by the community. 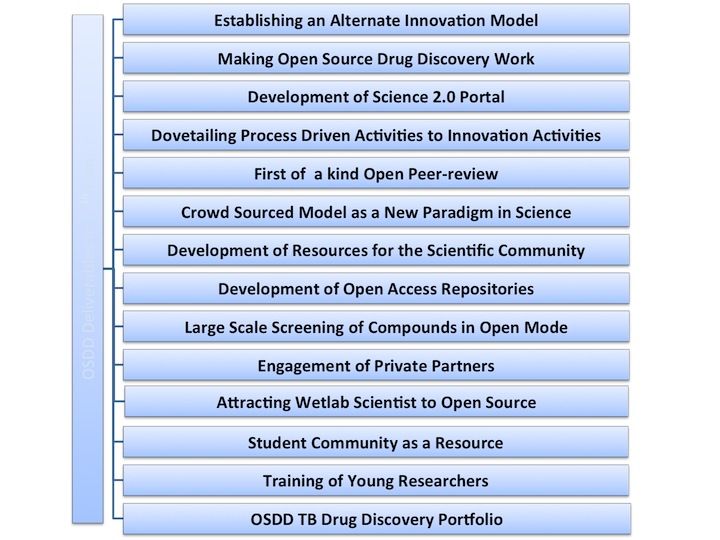 The OSDD TB community follows a multi-pronged approach towards drug discovery and amalgamates in- silico discovery with wet-lab approaches to reduce the time and resource consumption for discovering and developing novel drugs for TB. OSDD TB community comprises of researchers and students across the nation undertaking research spanning various aspects of tuberculosis management and drug discovery. Currently the research involves identification and validation of new drug targets, design of novel chemical entities, systems level pharmacophore modeling, generation of anti-TB models using PubChem bioassays, management and filtration of high-throughput screening data, development and maintenance of appropriate in vitro screening systems, investigation of natural products identified from traditional knowledge for lead discovery and optimization of potential leads. OSDD TB community is also working towards generation of novel computational resources that can aid in the process of drug discovery. OSDD TB is collaborating with national and international partners to accelerate the discovery of innovative therapies for TB. OSDD has signed MoU’s with L.R.S Institute of Tuberculosis & Respiratory Diseases and Global TB Alliance for conducting the pre clinical and clinical trials of potential drugs in India under the OSDD umbrella. The CSIR’s Open Source Drug Discovery programme for malaria (OSDDm) will function as a consortium with international partnership to promote a collaborative model for the search for anti-malarials. Efforts aimed at drug discovery and development for malaria are increasingly realizing the need to share results of initial anti-malarial screening, manage and filter high-throughput screening data, develop and maintain appropriate in vitro screening systems and animal malaria models, consolidate the search for new drug targets and their validation, design novel chemical entities, and investigate natural products identified from traditional knowledge for lead discovery. The research community for infectious diseases is alive to the need for open access and OSDDm offers a unified collaborative research platform for the malaria community to share existing resources and expertise geared towards drug discovery and development. This would ensure that harmonized procedures are followed and the requisite resources and reagents available in different laboratories are shared for specific objectives identified by the community. In extension of the OSDD paradigm, the malaria initiative will expand on wet lab approaches while retaining and building upon the computational approaches that have yielded important results in the area of tuberculosis. In order to leverage on international expertise and accelerate the discovery of innovative therapies for malaria and OSDDm is collaborating with national and international organizations. OSDDm has signed MoU with Medicines for Malaria (MMV) for research towards the development of new and effective drugs for malaria and conducting the preclinical and clinical trials of potential drugs in India under the OSDD umbrella.